I'm going to tell you a secret; only if you promise not to tell anyone else. The biggest tadpoles in the world are at Whonnock Lake. It's true, these big kids that live there told us so. Nathe and I had a contest to see who could capture "The Big One." You should have seen mine - it was humongous-only it got away. Nathe didn't catch one either, but he did find a "toonie" in the water. This one kid, she caught millions, but she had a net. Next time I'm going to bring my net for sure. If catching tadpoles isn't up your alley, you can go swimming. Whonnock Lake has a nice beach with sand on it. And, guess what, the water's not cold. I wasn't going to go in, but then Nathe splashed me. I'm glad he did, because otherwise I might not have seen the first fish. Nathe said he could catch one before me. Of course, I had to prove him wrong. Nathe tried to tell me he caught one, but it wiggled out of his hands before he could show it to me. Yah, right Nathe! We hardly saw Coleman and Mom. They spent their whole time at the playground. It is pretty neat. Even Nathe was having fun there. Also, the playground has big trees around it, so if you get too hot, you can go there to cool off. Unfortunately, Mom remembered to pack us a lunch, so we couldn't buy hot-dogs at the concession stand. Mom did let us have an ice-cream treat after we finished our lunch. I think anybody, no matter how old you are could go to Whonnock Lake and have fun. There's so many things to do at Whonnock Lake, it's bound to make everybody happy. Dad loves Whonnock Lake. He calls it Mother Nature's Playground -- in English - it's free! What I like about Whonnock Lake is you can do a whole bunch of stuff there. It's not the type of place you want to leave after half an hour because you're bored. 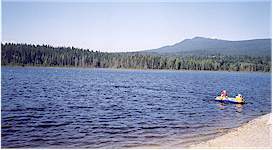 Beside swimming and hunting for the world's biggest tadpole you can go hiking or even canoeing too. Don't worry, if your canoe doesn't fit in your car, you can rent one there. Another secret Nathe and I found out is that every year the government dumps a whole truckload of rainbow trout into Whonnock Lake. Nathe and I are going to find out when the next dump is. And then we're going to ask Mom and Dad if we can go on the same day and put our rods in the water at the same spot they dump the truckload of fish. Nathe says we better bring a big garbage bag to carry all our fish home in. I better not forget to mention the playground, because it was pretty cool. Coleman sure like it. Mom had to carry him out, kicking and screaming at the top of his lungs. There's not much bad you can say about Whonnock Lake, except that it took us about 60 minutes to get there. We live in North Vancouver and Whonnock Lake is in Maple Ridge. Mom also wondered why the water had a brownish tinge. Dad said it was just the minerals in the water. To get to Whonnock Lake drive east on Dewdney Trunk Road through Maple Ridge. Drive south on 272nd Street from Dewdney Trunk Road, turn east on 112th Avenue and follow the signs. Web site: www.mapleridge.org, and www.whonnock.ca . Did you know a whole bunch of animals live in Whonnock Lake. Dad told us to keep our eyes peeled for beavers and muskrats, but we didn't see any. I did see some pretty birds though, which I'd never seen before. When Nathe and I asked Mom and Dad if we could go back to Whonnock Lake, they both said "yes" at the same time. I guess that means they had fun. Kids along the lake shore looking for the "world biggest tadpoles"